Look at how much potential this guy had! Loved the hardware so was happy when my customer wanted to keep it (not to mention filling in holes isn't much fun:)). I did spray them out in Oil Rubbed Bronze so the contrast with the green would be better. Before I sanded I stripped the top. I might have gotten away with just sanding off the original finish, because it was that old, but I prefer the extra step of stripping the main layer off, which not only ensures that my stain will penetrate much better, but evenly. Also makes the sanding easier. 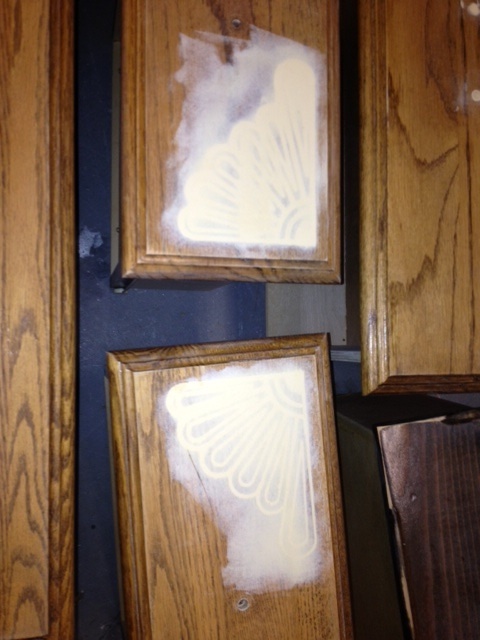 Another thing I always do is wipe it down with denatured alcohol and let dry before I stain. I feel that this also helps with keeping the stain even and cleans the surface well. I know some people like to use a pre stain sanding sealer, but it just doesn't seem to work out the best for me and raises the grain too much, making extra work. 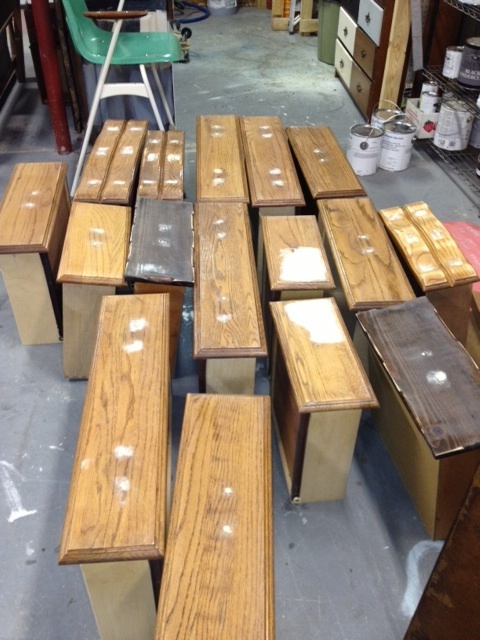 After 2 coats of the Minwax Dark Walnut stain I covered the top to spray prime the base. I didn't clear coat the top first because I wanted to do the the entire piece at once. Had NO idea what I was thinking, maybe I have way too much going on but I removed the top cover before I sprayed the green! Was so mad! Had to go cover it again. Took me a whole 3 minutes. DATED VINTAGE TO VINTAGE MODERN! I am really loving this set. To be honest, it isn't different from many of the sets and pieces I have transformed in the past year or two. But it still amazes me how all the hard work I do of patching, sanding, hole filling, priming, sanding, sanding, sanding, priming etc...really pays off! Not my most miraculous "before and after", but pretty non the less! You will notice how I removed the emblem from the top middle drawer. Might be pretty for some finishes but my customer was looking to make this set more modern, so the emblem had to go! The modern sating nickel hardware is perfect! LOVE the perfect, seamless finish! BIG BEAUTY WITH GRAY AND BLACK GLAZE! 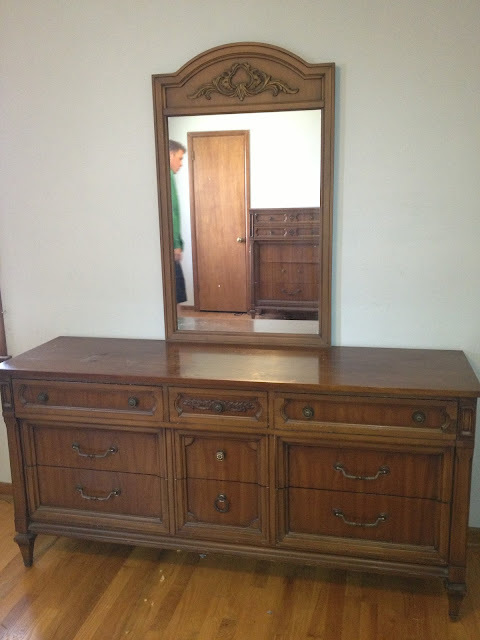 I loved this piece even before it was paint mainly because it was SO BIG and curvy with tons of drawers. 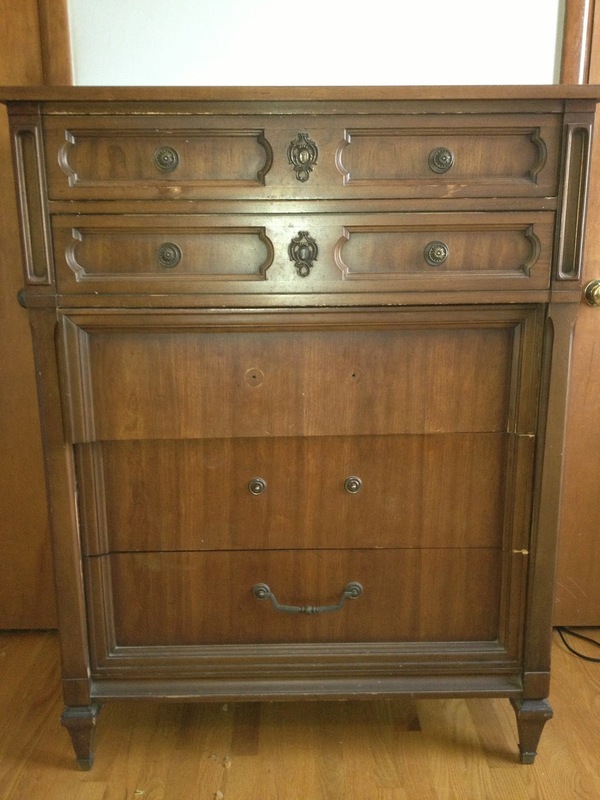 It is also solid wood and very heavy but worth the back breaking work of getting it home! After the base coat of BM-Morning Fog was sprayed and cured. I glazed it with my favorite black glaze by General Finishes. Definitely a little darker with more depth in person but I always seem to have a hard time getting a true color with my florescent shop lights. The original hardware was sprayed in Rustoleum oil rubbed bronze. 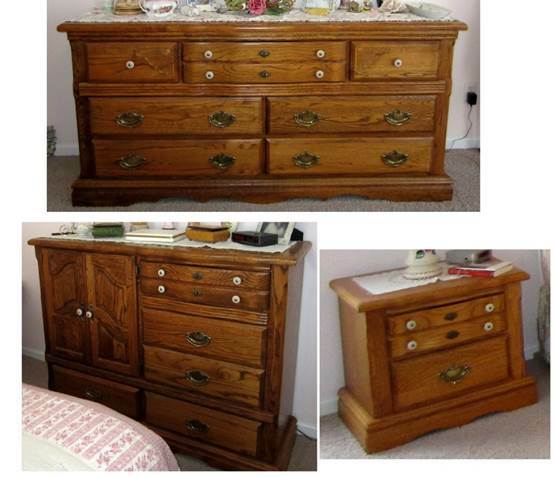 OUTDATED OAK BEDROOM SET GETS A FRESH MAKEOVER! 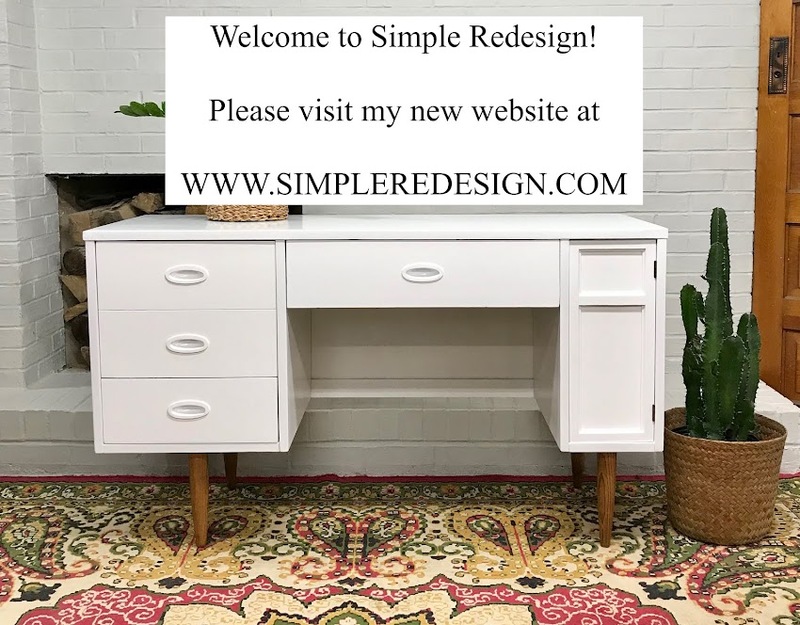 I had a welcome challenge this past week of working on a customers beloved bedroom set that she has had and loved, for years. She was in the middle of updating the bedroom and knew that painting the dated oak pieces would be the necessary change to truly get the look she was going for. You can't see it easily but there was a "fan" type pattern on the doors and a couple drawers. Because my customer trusted me and said "do whatever you think it best", I filler them in. It can be a little tricky and because this set is getting a modern, seamless look, it was extra important to perfect this part. It took a few layers of filler but was well worth extra time and work. I also had a lot of holes to fill. I always use cut dowels first, putting some wood glue in the hole and insert a dowel, making it JUST slightly lower than the surface then add the filler after the glue dries. I also like the dowel very tight and have been know to actually drill the whole a tiny bit larger if needed, to get a size to fit tightly and gently push it in with a hammer. The color is a BM color called "Cotton Balls" and a wonderful soft shade of white. I love the update the glass hardware gives to the set. Loving the fun colors I've done the past few weeks. Not often (or ever) do I get a cool vintage KING headboard! Defiantly a fun statement piece. 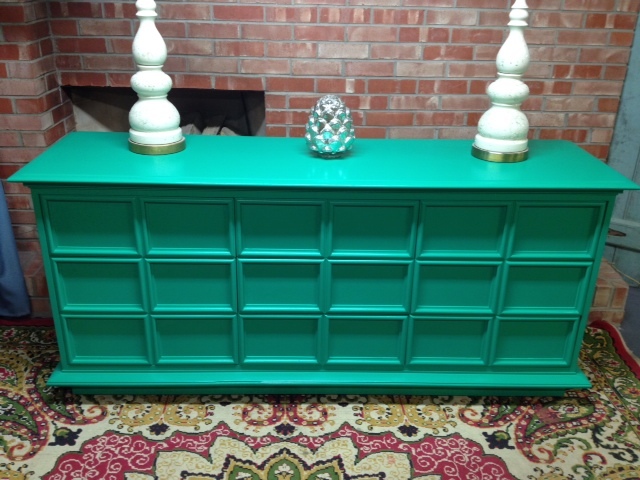 This customer had this antique piece and wanted a punch of color in her kitchen. Always bold and loving color, this Designer was looking for a statement piece in her master bedroom. Customer wanted something soft, pretty and different. Still in love with coral and thought it would look pretty with a dark rubbed oil bronze hardware.